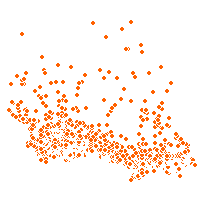 The Geographic Attribute File is a dataset that contains census geographic information at the Enumeration Area level for all of Canada for the 1981 census. Each record includes geographic coordinates, population and dwelling counts, land area, names, unique identifiers, and geographic codes for linkages with other census boundaries. The original dataset is available from Statistics Canada as a text file (.txt). For view in Scholars Portal, the dataset was converted from this original format into a Shapefile using the point coordinates available for each record. Each point is the population centre of an Enumeration Area.